Websockets are a fantastic and underutilized API. 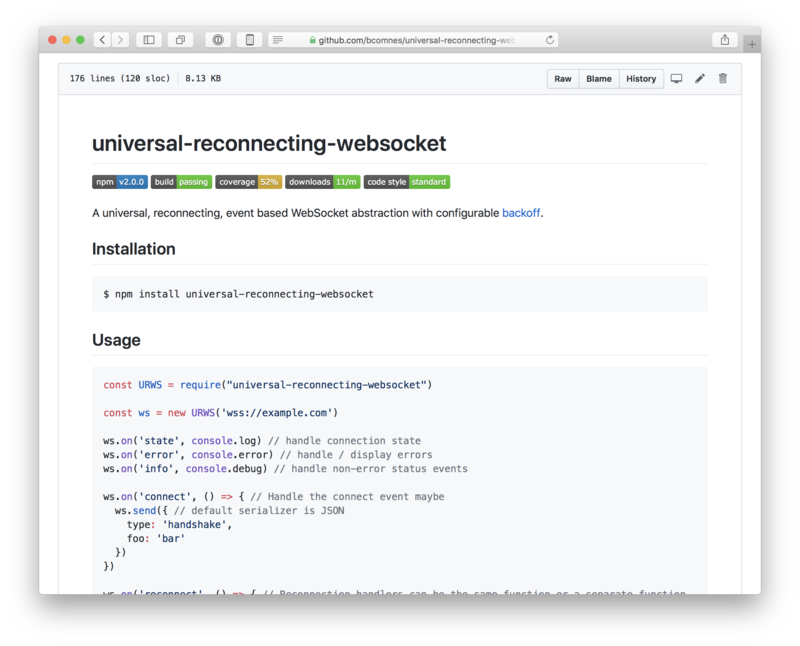 Here are some tools and experiments I built to make working with websockets a bit nicer. The idea behind this library was to bring the wrapper API that I desired for websockets to both Node.js and Browsers in a unified way. It turns out, that there are a bunch of subtle but incompatible API differences between the ws client and the one found in the browser, so ultimately, I was a bit disappointed with how this experiment turned out. I was very happy with the browser side of the API. I think this part turned out great, and was what the surface API was designed against. The Node.js API was essentially mixed on top of the API that was implemented against the DOM api. The ws client has a lot more options than Browser websockts, and a number of key differences around protocol and binary options, which would require one to write two sepearate clients for Node and Browsers which kind of defeated the purpose of a universal client. I did not realize this until after I wrote it. The next step for this project would be to implement two specific abstract reconnecting sockets with the same API, but implemented and documented specifically to the socket type it is written around. Don’t try to write a “universal” module when wrapping io primitives. Instead, implement an abstract version of the api specific to the io primitives it uses. If, down the road, it is determined to be beneficial to have a single module that automatically chooses which underlying abstract implementation to use based on the environment, you can use the singular abstract implementations to achieve that. Universal modules should usually only be for algorithmic modules. It’s not much but it acts as a handy reference on how to implement a naive chat server with limited features. It is hosted on Heroku and is completely separate from the client, other than the protocol assumptions. 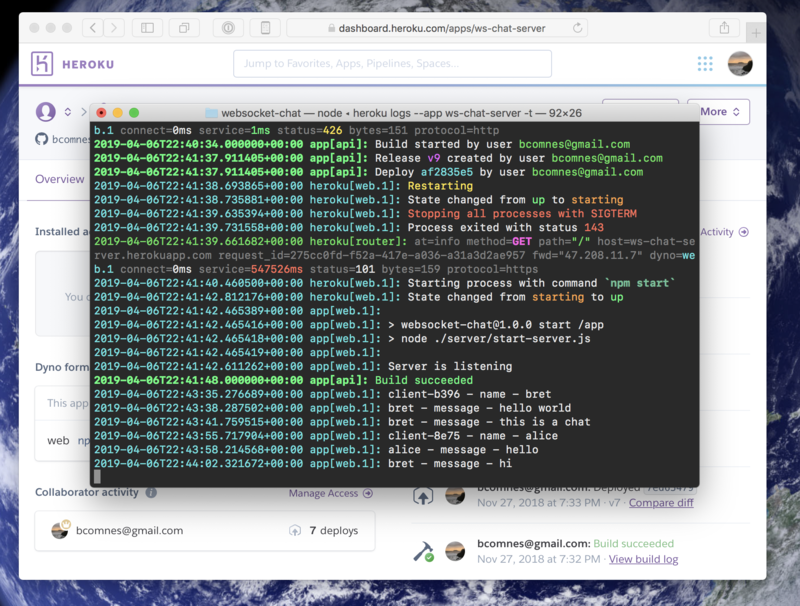 This is a prototype grade example of a real time chat app that uses universal-reconnecting-websocket and connects to the websocket-chat server. The application is completely static, and can connect to any arbitrary websocket-chat server, demonstrating a JAMStack architecture. Keeping the client and server decoupled ensures you have to take care of all protocol assumptions up front which would help ensure you could implement other clients against the same server (for example, a native mobile app client). Essentially: it lets you write class methods and use them as event handler functions, without binding. This has some performance implications if you have many event handler functions, and arguably some ergonomic gains. When implementing universal-reconnecting-websocket, it was assumed that the EventLister api could be mocked for the ws client events. It turns out, this wasn’t easy. 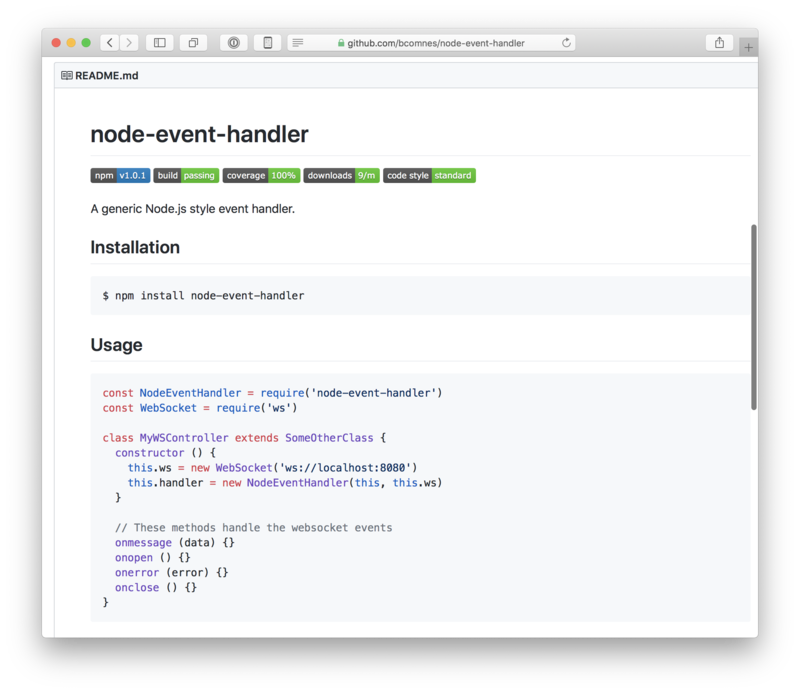 Node.js events don’t support the handleEvent method, like DOM events. The shape of the event data objects are totally different in both systems. 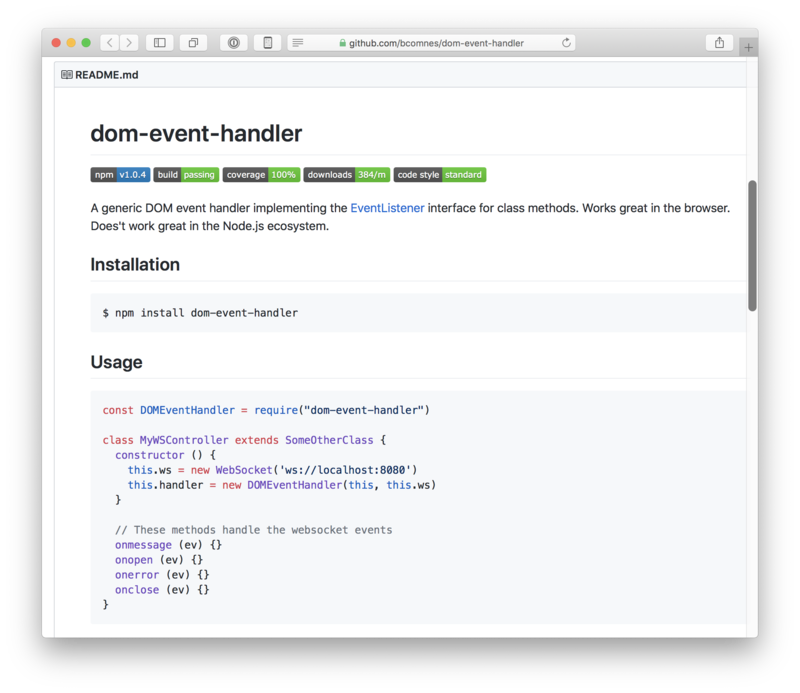 DOM events are a large API and difficult to simulate in Node.js. These differences broguht me to the following conclusions. When Node.js was the hot new thing, it was in vogue to implement Node compatible API layers for the browser. It was usually straight forward, but inevitably a userspace solution. This had a lot of advantages (like nice and simple APIs that worked effectively) and little drawbacks other than a bit of extra bundle size and lack of a standards authority dictating how things should work. browserify used this strategey to great effect, and it still works great today. As Node.js aged, and its opponents slowly regained power to push back against its influence, and as Node.js’s innovations slowly sublimated into implemented, yet incompatible “standards”, it became fashionable to implement DOM apis compatible for node. The sudden interest in node-fetch is testament to this trend, despite many bugs, and awkward differences between it and the real DOM API. 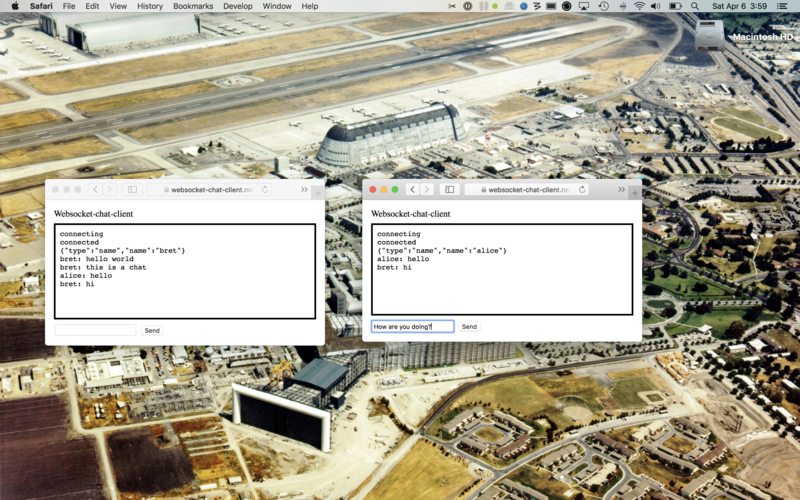 Porting Node.js APIs to the browser is easy, since they are fundamentally simple, userspace derived APIs. Porting Browser APIs to Node in userspace is not easy, complex and error prone. Avoid doing it. See the key takeaways from urws above for the proper way to handle IO abstractions. Node events are simpler to understand, but lack the handle event API found in the DOM. Maybe a userspace event system could accommodate this a bit better, and still remain simple and compatible with Node.js events. DOM events are complex and way more difficult to comprehend, especially for newbies. The handle event method is a neat idea to avoid binding, but re-introducing the complexity of DOM events to node is not a good idea.